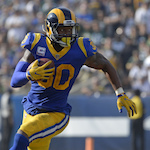 The Los Angeles Rams offense may depend heavily on the passing attack and play of quarterback Jared Goff but no one can dispute the fact that its true engine is running back Todd Gurley and the zone running schemes that stem off him. This season they were second in points scored and second in yards allowed per game trailing only the Kansas City Chiefs. In fact, head coach Sean McVay and his Rams are second to none when it comes to scoring offense as they’ve scored 31.4 points per game since 2017, which stands as most in the league in that span. So how can the Rams maintain that level of offensive proficiency in the Super Bowl and use it to beat the Patriots? The Rams focus in creating movement in both the point of attack and at the second level. Not surprisingly, this season the Rams are 11-0 when Todd Gurley has 15 or more rush attempts. On the other hand, in their three losses, he averaged just 48 rushing yards per game. Furthermore, in each of the Rams 13 wins this season Gurley had more than 130 yards from scrimmage which includes the passing plays. Gurley’s relevant not only because of the rushing yards he gains but because of how the Rams try to involve him in the passing game. This season, including the playoffs, Gurley has 10.6 yards per carry on screen passes, which is most in the league for backs with at least 15 receptions. Furthermore, since coming into the league in 2015 he has more catches and receiving yards than any other back in the league. More importantly, Gurley is money in the red zone as this season he has more touches, yards, and touchdowns than any other offensive player in the league. But Gurley’s a key offensive asset not only because of his production but because of the influence he has on the game. The Rams play-action game is critical to keep the chains moving and protecting Goff. Their run game and the small ball underneath to Gurley are both key to how they prepare to run their three-level throws with passing options at the high, intermediate and low levels. The versatility and flexibility of those schemes have allowed Goff to earn a pass rating of 139.5 on designated rollouts this season, which ranked as the best in the league including the playoffs. That flexibility is what allows the Rams to slow opposing defenses and disguise so well what they do on offense and that’s what they must keep doing this Sunday to get first downs, keep Brady off the field and win Super Bowl LIII.